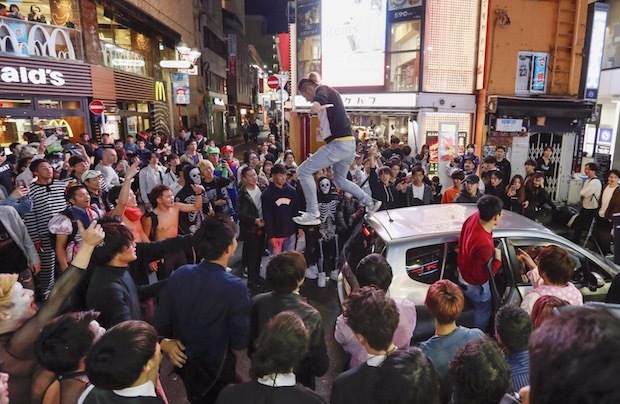 The tolerance for Halloween in Tokyo may be on a knife edge after some revellers in Shibuya caused vandalism and overturned a vehicle, resulting in arrests over the weekend. 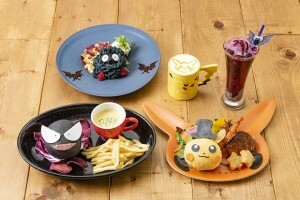 Halloween has developed in Japan from a barely known foreign custom celebrated publicly by a handful of rowdy non-Japanese residents to a massive commercial event with most stores and malls today cashing in on the theme, and, even more significantly in recent years, a large flash mob cosplay gathering in such centers as Shibuya. 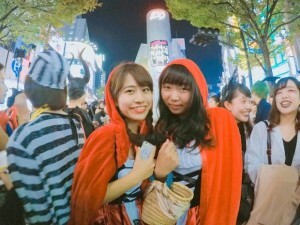 For the weekends leading up to and even after October 31st, tens of thousands of people gather to drink and celebrate, many wearing costumes (though often with little resemblance to traditional Halloween motifs). The peak is October 31st itself but also the closest weekend date. The police and local authorities were wary of this phenomenon for a while but seemed to accept it. After shifting from an indoor event in bars and clubs to an unauthorized street party from around 2014, a turning point was reached in 2016, with police pedestrianizing Shibuya’s Scramble Crossing for several hours as the only solution to deal with the crowds. This amount to a tacit condoning of the celebrations. Police also deployed “DJ cops” to issue instructions to the crowds, exhorting them to behave and pick up trash. Multi-lingual speakers were also introduced in 2017, since the event is popular with young people of many nationalities. However, the street party on Saturday night seemed to descend into a near-riot in Center Gai. In the early hours, a small truck was trying to negotiate its way through the crowds but was eventually stopped and then overturned by what appeared to be a group of mostly males. Social media showed visible tensions between some, apparently drunk participants and police officers. On Sunday, police announced five arrests for roping, camera voyeurism, fighting and destruction of property. No injuries were reported, however. The police presence has always been heavy and was apparently higher this year. After the weekend’s events, security measures will likely increase on October 31st. This may also have implications for the New Year countdown event that Shibuya ward now officially holds — again, emerging after it became common for crowds to gather in the area. Given the risk of crime, rising levels of garbage, and the inconvenience for local businesses posed by the crowds, next year’s Halloween street party may not be allowed even to take place at all. I went to it on the 30th and 31st, and I wouldn’t be surprised if the police didn’t allow it next year. The 30th wasn’t so crowded and the crowd was really well-behaved, but the 31st was a different matter. On the Wednesday night it was crowded like I’ve never seen it before and the the crowd control plan seemed badly implemented because in some areas people were getting pushed around, feet were getting stamped on and some smaller people were nearly getting pushed over. I also saw two rescue crews trying to get to people, but they had a lot of trouble doing their job because people just couldn’t get out of their way. Hopefully someone will have a better plan for next year, because it would be a tragedy if the event is cancelled/banned.